Suquamish Tribal Court Offices are open Mon-Fri 8:00 a.m. to 4:30 p.m. The Suquamish Tribal Court is the forum where the people of the Suquamish Tribe and the native residents of the Port Madison Indian Reservation can resolve their differences and disputes in a peaceful manner, consistent with the Suquamish Tribe Constitution, laws, rights, customs and traditions of the Suquamish People. The Tribal Court offices are open Mon-Fri 8:00 A.M. to 4:30 P.M. There are also regularly scheduled court dates set each month for Juvenile Court, criminal cases, civil cases and civil traffic hearings. Additional hearings are also scheduled on an as-needed basis. 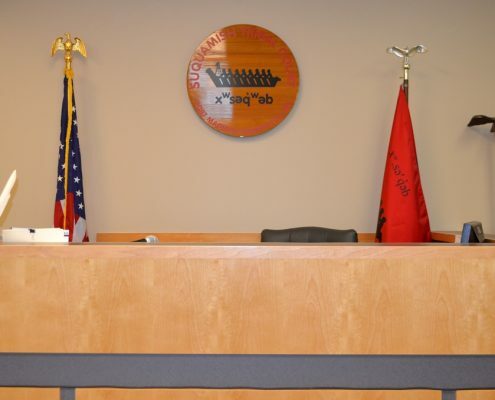 The Suquamish Tribal Court also provides Tribal Members with services that are found in other courts including civil paperwork for the following matters: Child Support, Civil Claims, Name Change, Parenting Plans, Protection Orders, Marriage Licenses and Dissolutions.